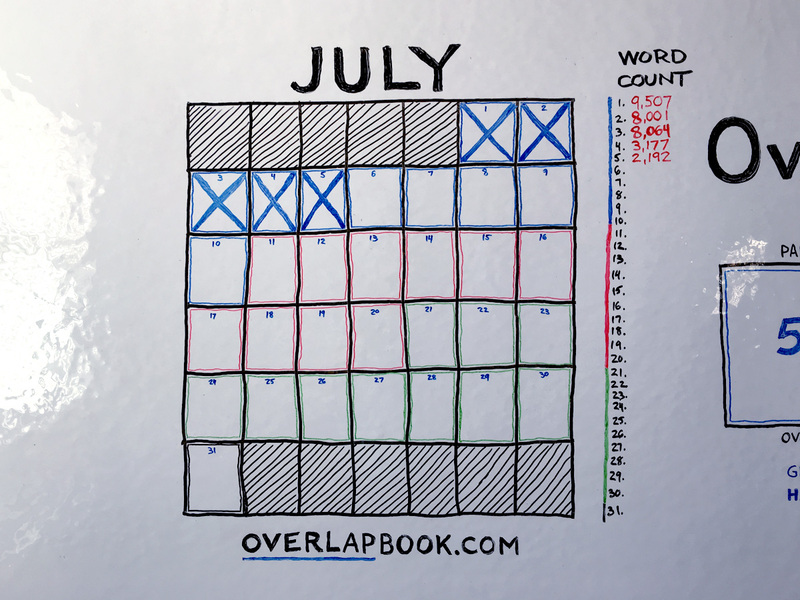 Day 5 – Writing a 100,000-Word Book in 15 Days? I thought I set my alarm for 4:30am, but I must have accidentally dragged the hour to the number 5 because that’s when it went off. At any rate, I woke up at 5:36am after getting 7 hours of sleep, which actually felt great. I wondered why I felt great getting 7 hours because it doesn’t line up with the 90-minute duration of a typical sleep cycle. When I looked at the graph, I counted four sleep cycles, but instead of being the usual 90 minutes, each was 105 minutes—totaling exactly 7 hours. I guess that’s why I felt good. I didn’t run today because of the later start. I hope to get back on that tomorrow. I’m writing a book in a month and I’m journaling every single day to share the process. The book is called Overlap: Getting from the life you have to the life you want. You can learn more about the book at OverlapBook.com. Below, you can view the complete list of journal entries ↓. I have plenty of topics to write on, but I found that today my mind was still in big-picture mode since yesterday’s big update (consolidating what was three books into one). Rather than fight that to hit my word goal, I spent some time mapping out the book and outlining the three sections. I’m still getting accommodated to having all three parts in one book. There’s probably another day or two of structural work left to do, but I think I’ll be able to get back to a more productive word output tomorrow. Roughly 5 chapters, but maybe more. At 3,000–4,000 words per chapter, it’s looking like the book will be in the ballpark of 100,000 words. Even with today and yesterday yielding low word-counts, I still wrote the first 30,000 words in 5 days. However, that was a very intense pace that had me working as many as 18 hours in a day, which was not at all pleasant. If I continue at a more comfortable pace of 4,000–6,000 words a day, that should have me completing the book in a very reasonable 2 weeks (assuming I continued to work weekends). That would give me another two full weeks to edit, which would be fantastic! That’s probably overly optimistic though—and it doesn’t account for any less productive days, unforeseen research, further expansion on Parts II and III, or any additional recoup time on weekends (which I’m sure my wife would be very happy about). So let’s assume it will take me another 3 weeks to finish. That will still give me a full week to work on editing. I’ll be honest, 2,000 words today feels small. Embarrassingly small. But I have to remind myself that the research and planning is important. Having a big goal like 8,000 words a day helped me strive. The positive side effect is that 2,000 words seems incredibly tiny. You have to normalize what feels big to you. This was also the first serious work day for my team since I started writing the book on Friday (Monday, Day 4, was a holiday), so people are back in the office now—a.k.a. my house—and that was a bit distracting. I also jumped on our weekly team call today to check in with everyone, which took me out of focus mode and wasn’t good for my productivity. I didn’t have to do this and I’d already set the expectation that I would not be available this month, but I chose to do it anyway because I thought it would be fine. It was one of those, “I’m already pretty distracted today anyway, so what’s another distraction?” kind of decisions and I don’t think it was a good one. I got a late start due to setting my alarm improperly. I was generally distracted and did not adhere to the rigid rules and Do Not Disturb modes that I had during the first 3 days. My output clearly reflects that. I’m convinced running is the secret ingredient and I didn’t run. It’s not the running I miss—it’s the feeling of owning the day. I didn’t start working on today’s journal until 3:45pm and it’s already 6pm now. I’ve been adding little improvements to the journal as I go—today, for instance, I added the book promo box underneath the word count stats. I still have to finish the write up, proof, edit, take/edit/upload/embed photo of whiteboard, publish, setup for live stream, create Facebook Live event, create new graphic overlays for live stream, test record, official record, write notes for video recap, stream a video recap, embed video in journal entry, update journal entry links list shortcode, share on Facebook, share on Twitter, share on Snapchat, share in Community, send push notification in Community—oh, and I haven’t had dinner. Creating these posts takes me an additional 3–5 hours each day on top of my writing. It’s for this reason I’ve decided to forego the 8,000-word goal in favor of a time limit. My new plan is to write as much as I can by 3pm. At 3pm, I stop (writing on the book, anyway—the “Writing End Time” does not account for the time it takes to write the journal). I will still write as much as I possibly can—I am aiming for 4,000–6,000 words a day if possible—but I plan to stop at 3pm to allow time for creating these journal entries. Sometimes we want a perfect story, but a perfect story is not an interesting story. Putting out these journal entries is stretching me in a really good way. Live streaming a video recap every single night is too. Neither is perfect. I’ve made mistakes, and I completely changed how everything is being packaged—it’s all been iterating in public—but the feedback has been tremendous. 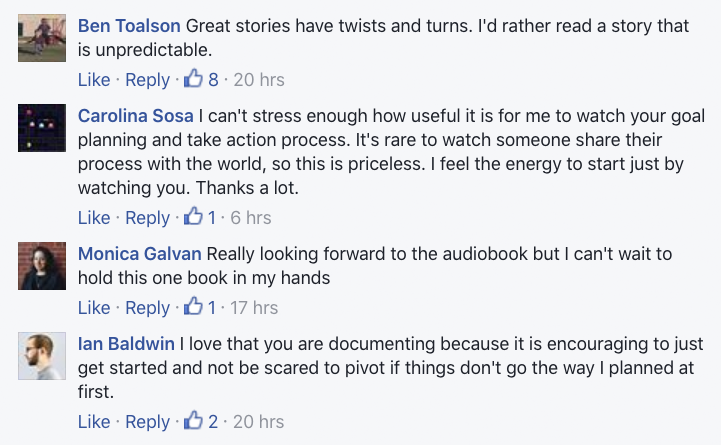 The support on last night’s live stream when I revealed that I was consolidating the three books into one was incredible, thank you. Don’t pat yourself on the back for your perfectionism and high standards. Without the discipline to ship, you’re a glorified procrastinator. Perfectionists allow their obsession with perfection to keep them from shipping work—they insist it doesn’t deserve to see the light of day. There is value in shipping the imperfect. Resisting perfectionism is not about putting out shoddy work. If your standards are so high they cause paralysis they’re not good standards. Lower the bar of perfection mentally to 90% and enable yourself to get started. Put out work and let the imperfections drive you to create. You only close the gap between what you make and the image of perfection in your mind with a sea of imperfect work. Perfection is the shadow of excellence. Chase it, and you will never reach it. Pursue excellence instead—for it can be obtained. Day 15 – I Finished the Book!